Google Docs has been given a key new piece of functionality, allowing people to embed files like PDFs and PowerPoint presentations directly in their web pages without a download. Google's cloud based docs are growing in popularity as the internet giant adds functionality like the ability to view PowerPoint and TIFF documents without having to download the. And now people will be able to bring this embedded viewer to their own websites and blogs. "Viewing files right in your browser is fast, and it keeps your downloads folder clean," explains Google on the official Google Docs blog. "Plus, it spares you the hassle of saving your files to the machine you're using, which could be a shared or public computer. 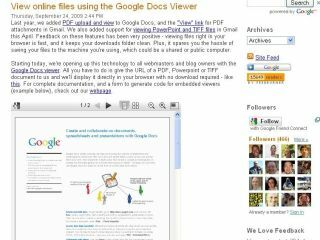 "Starting today, we're opening up this technology to all webmasters and blog owners with the Google Docs viewer. All you have to do is give the URL of a PDF, PowerPoint or TIFF document to us and we'll display it directly in your browser with no download required."